Let us see a dreamy patio to spend your leisure time at spring with green and pink color decoration. The designer adds with potted greenery to give fresh air and natural atmosphere. Then, the role of lanterns and candle lanterns come to show brighter outdoor area at night. Let your guests enjoy their time at this comfy carved daybed to take rest after long journey. Furthermore, a vintage mirror looks awesome to add traditional style. The metal lanterns and a tray with drinks let them enjoy your outdoor view. 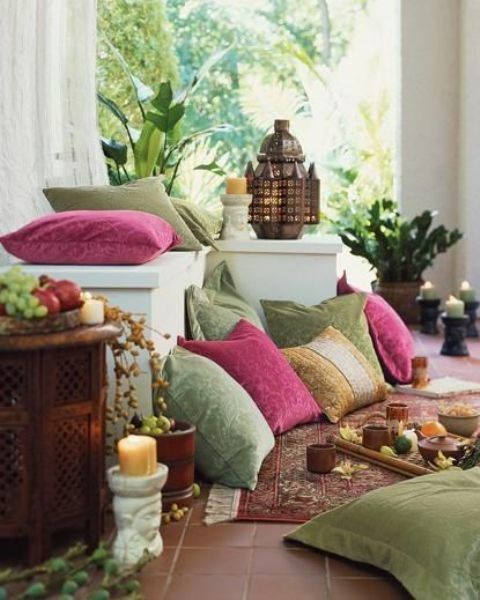 Here it is again a welcoming Moroccan patio that will make your guests feel cozy with wicker and wooden furniture. 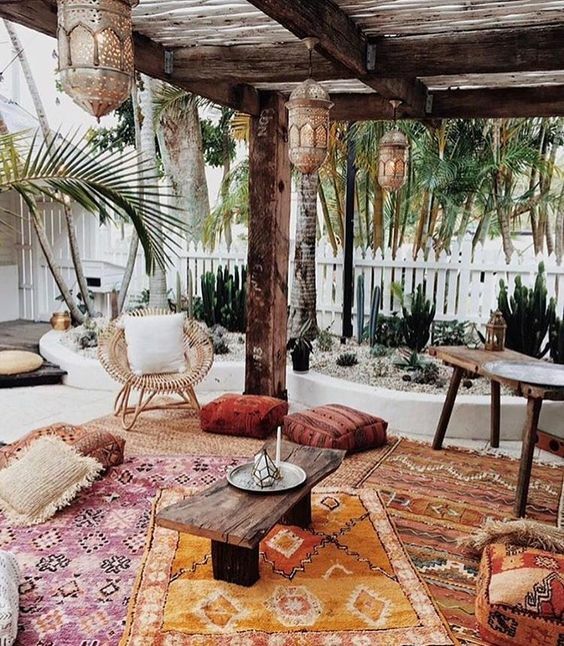 There are Moroccan lanterns and colorful rugs that upgrade your outdoor view. 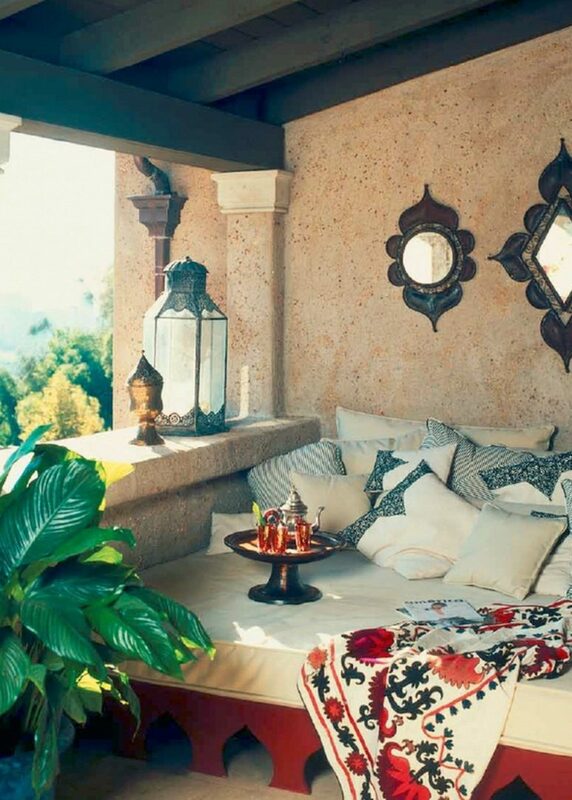 Then, cushions also play role to rustic touch. 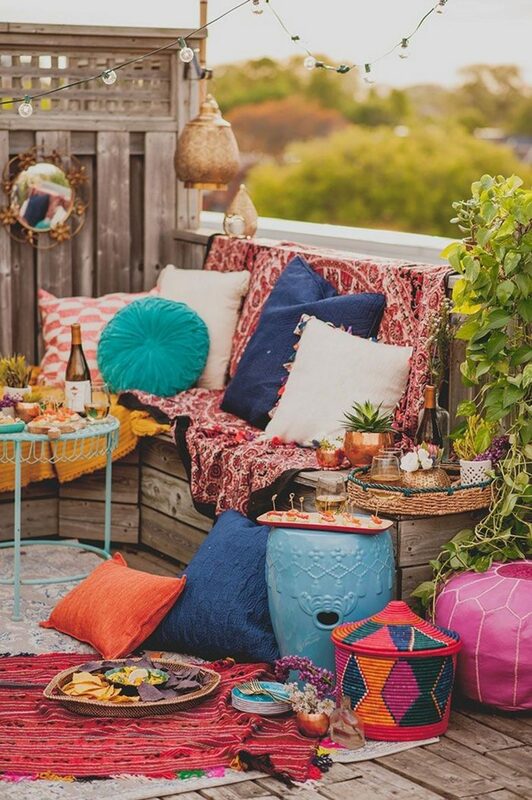 When you love cheerful outdoor design, this super colorful Moroccan patio may fir to your wish. Let see the bright pillows and blankets that look attractive. After that, rugs, baskets and ottomans works well plus a mirror and lights to shows how excited the designer when decorate this patio. 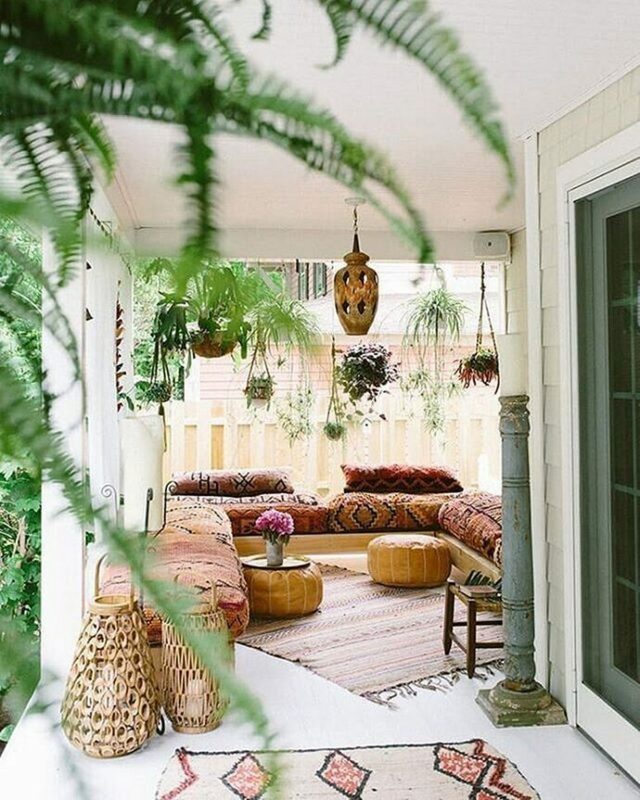 Add natural elements through hanging potted greenery to make your outdoor look fresh and eye-grabbing. 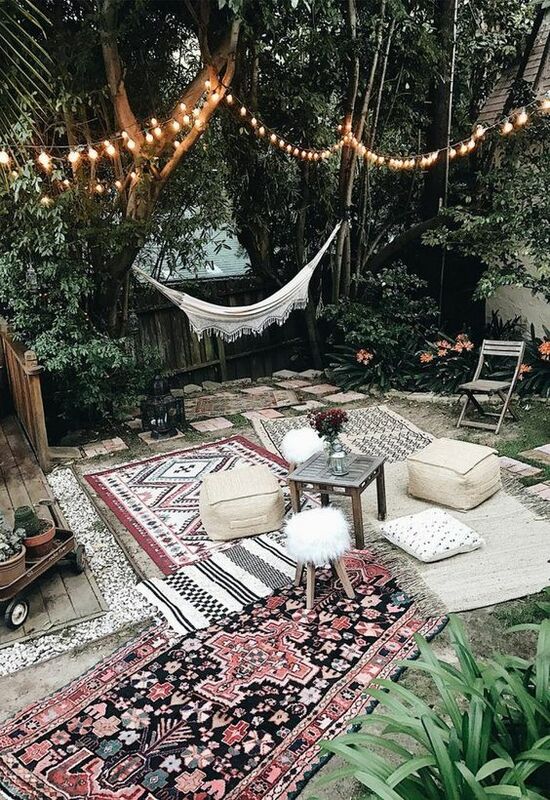 You are pleased to add boho rugs, boho textiles and rattan lanterns for more splendid outdoor area. This is the best place to spend your leisure time at holiday or just after working along time. Lay at hammock to take a nap will refresh your mind. Then, you may also just sit awhile at patterned boho rugs or leather ottomans to rest your body. This design is completed well by low furniture. U-shaped sofa let you and your friend enjoy outdoor atmosphere anytime. 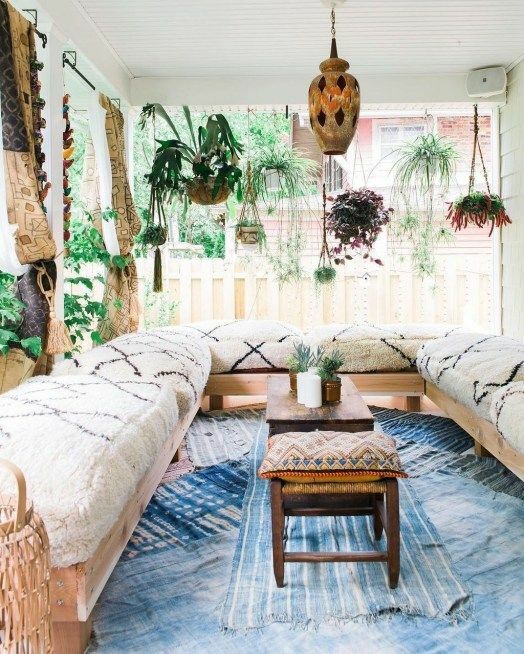 Then blue rugs add a touch of clean and fresh with hanging potted greenery. The owner of this house also applies low furniture. Let your outdoor look bright with U-shaped sofa and colorful pillows. When the night comes, some glass lanterns will make this area brighter. Then, leather ottomans and carvings shows that Moroccan is full of artistic value.